Would you like to start the new year with a whiter, brighter smile? 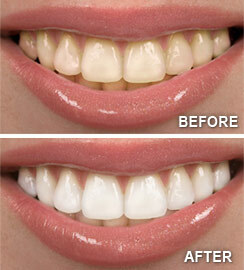 Teeth whitening offers a safe, effective way to remove the stains that dull your tooth enamel. Glendale, CA, dentists Dr. Navasart Kazazian and Dr. Apel Keuroghlian of New Smile Dental Group discuss the whitening process. Whitening products, whether you buy them at a Glendale drugstore or obtain them from your dentist, break apart pigments that cause stains. Those pigments lodge in tiny pores in your enamel after you eat or drink bright or darkly colored foods and beverages, such as coffee, tea, cola, wine, popsicles, or soy sauces. Is professional whitening or over-the-counter whitening the better option? The whitening agents available to dentists are stronger than those used in over-the-counter kits. When you obtain whitening gel and trays from your dentist, your teeth may lighten more rapidly than if you use drugstore products. 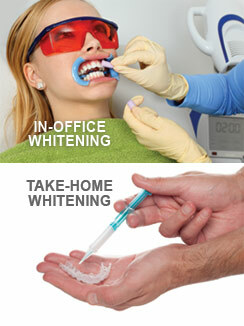 Professional whitening is also a safer option. It's very important to protect your sensitive gums and roots from contact with the whitening agent. If the tray in your kit doesn't offer a precise fit, your risk of irritation and sensitivity increases. When you choose professional whitening, your trays will be created from impressions of your teeth to ensure a perfect fit. Your dentist will also tailor the process to meet your needs. For example, if you've experienced sensitivity in the past, you may find the whitening process much more comfortable if your dentist gives you a weaker whitening solution to use with your trays. How will I whiten my teeth? You'll place carbamide peroxide gel in your upper and lower trays, then wear the trays overnight or at least for an hour or two. After three or four weeks of daily use, the whitening process will be complete. Brighten your smile with teeth whitening. Call Glendale, CA, dentists Drs. Navasart Kazazian and Apel Keuroghlian of New Smile Dental Group at (818) 547-4398 to schedule your appointment. Want to learn more about teeth whitening from New Smile Dental Group? Call our Glendale, CA office at (818) 547-4398 for more information!